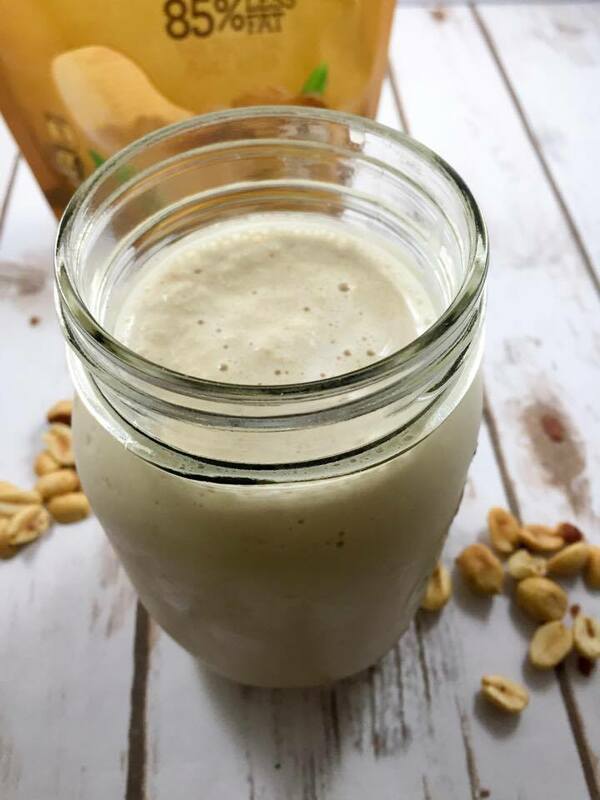 Rich and creamy, this Peanut Butter Milkshake is so healthy you could have it for breakfast (really)! This recipe is also low carb, low fat, sugar free, and a Trim Healthy Mama Fuel Pull! 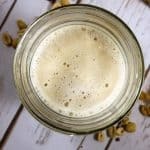 Peanut powder is one of my favorite products! The first peanut powder I ever tried was the Trim Healthy Mama Peanut Flour. It is De-Fatted, which means 1/4 cup of this peanut flour only has 4 grams of fat, as opposed to regular peanut butter’s 32 grams per 1/4 cup! Now don’t get me wrong – I’m the girl who loves to eat peanut butter with a spoon, straight out of the jar! Anyone else with me? While there is nothing inherently wrong with that, it can be a calorie bomb, for sure! So we have Peanut Flour to the rescue! For Trim Healthy Mamas, peanut flour means we can now have peanut butter flavor in our E and FP meals and snacks – awesome! One idea I love is adding this peanut flour to plain greek yogurt and using it as a dip for apple slices! You can’t go wrong with peanut butter and apple! You may also enjoy this Peanut Butter Cookie Dough Greek Yogurt. Or this Peanut Butter Chocolate Chip Cookie Dough! Unfortunately, when I created this recipe I was out of the THM Peanut Flour (sniff, sniff), so I had to use the JIF Peanut Powder which can be found at most Wal-Marts. It is good, but not as good as the THM brand. And while we are on that topic, I have found that Trim Healthy Mama’s products as a whole are much superior to any other brand. However, if you are feeling the need for a bit more fat, you could use a heaping Tablespoon of natural (no sugar added) peanut butter in place of the peanut flour. You could also add a Tablespoon or two of heavy whipping cream to really up the creamy factor. But I love to have this as written and enjoy it as a Fuel Pull. Honestly, all the peanut butter flavor is there and the cottage cheese makes it seem rich and creamy. I don’t miss the full fat peanut butter or cream. If you look at the nutritional information below, you will see that it lists 6 grams of fat, which is barely over the suggested 5 grams for an E or a FP. However, unsweetened almond milk and low fat cottage cheese are both considered FP foods so long as you don’t go crazy with them. The sisters themselves have mentioned at various times that those numbers are only meant as a guideline, not a hard and fast rule. I often get a lot of questions about other peanut butter flour/powder products. The most common question is related to PB2. I know people will ask, “Can you taste the cottage cheese?” I don’t think you can. The cottage cheese is what makes it creamy, and I think it lends a light cheese-cakey flavor. I used to detest cottage cheese with a passion, but now I put it in nearly everything! If that sounds good, you may like my Secret Ingredient Chocolate Peanut Butter Milkshake! So, what do you need for this Peanut Butter Milkshake? 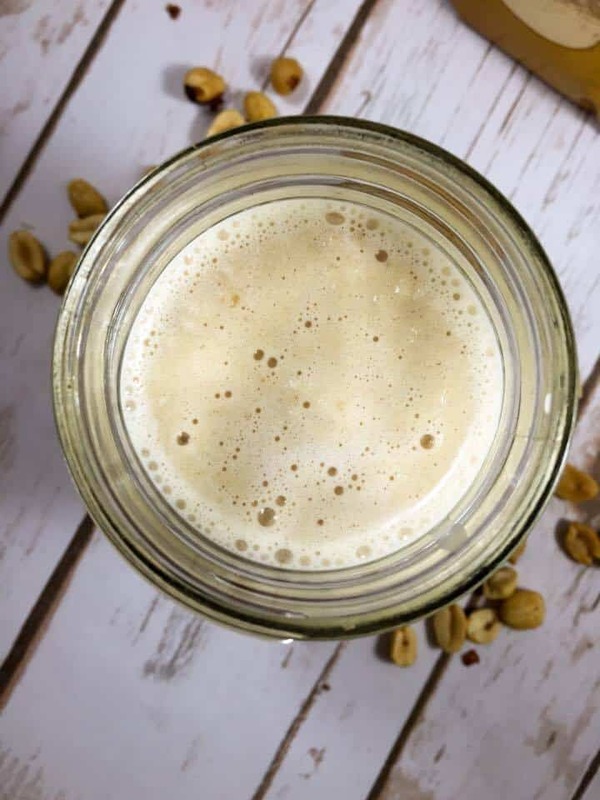 Rich and creamy, this Peanut Butter Milkshake that is so healthy you could have it for breakfast (really)! Place all ingredients in a blender, and blend until combined! Please note that this milkshake, as written, is a FP, but if you add more fat or pair it with fat, it will push it over into S mode. If you want an S milkshake, feel free to add 1 Tablespoon of sugar free natural peanut butter! Minus the fiber from the total carb count to get the net carbs. The net carb count for this recipe is 9. This post was originally published on October 14, 2016, but has been revised and updated as of May 30, 2018. Quick question: wouldn’t you also subtract sugar alcohols? Yes, I do subtract sugar alcohols, but they are already subtracted in the Gentle Sweet when I add the nutrition information to the recipe. Love, love, love peanut butter. Can you use JIF natural peanut butter to substitute? Absolutely! I use Adams natural no sugar added peanut butter sometimes! I tried this for breakfast this morning. I didn’t have the collagen powder, but did some research on the difference between it and beef gelatin. They seemed to be very similar so I decided to try it with the gelatin since I had some of it. The results weren’t disastrous, but I couldn’t drink very much of it. The problem wasn’t in the taste, but the gelatin didn’t mix in, but collected in small chunks and one big chunk. I finally strained the shake to get all the chunks out of it and put it in the freezer to try the rest of it tomorrow. What would have caused the gelatin to clump up like that? Was it because I added it in with the rest of the ingredients before processing it? I guess I’ll have to invest in one more expensive ingredient if I want to make this again! Hi Marijane! I am so sorry you problems with the recipe. Gelatin behaves very differently from collagen. Gelatin (while it has similar benefits to collagen) is used to thicken and gel recipes. It has to be “bloomed” in water before you use it. However, the good news is that the collagen in this recipe is not an essential ingredient. I just added it for protein. This is one of my favorite go-tos when I can’t decide what to have! De-lish! Thank you so much for providing such amazing and delicious recipes. You and your effortd are truly appreciated. 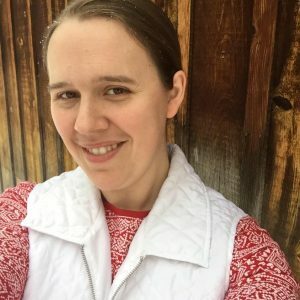 I have recently been making my own fp keifer and have been subbing it in olave of almond milk a lot. I am assuming i can do the same with this recipe yes? Yes! Kefir should work great! This is delicious. Thank you. I am one day out of surgery and needed something easy thatvwould t hurt to eat and this hit the spot. Had run out of almond milk so just used reg milk and am not going to worry about it. Could you add coca powder to this for a chocolate/peanut butter or would it push it into S category? I love this recipe but just wondering if you could add that because i love Reece’s!! !